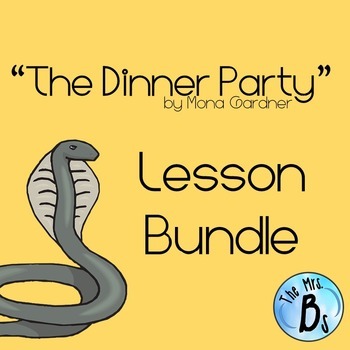 This rigorous annotation and analysis guide is CCSS Aligned and asks students to engage with the classic short story “The Dinner Party” by Mona Gardner! 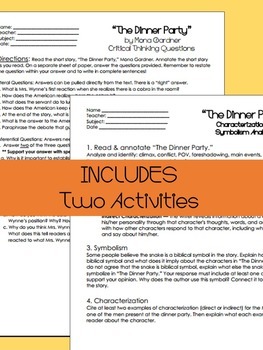 In addition to students reading, annotating, analyzing, and synthesizing the information, students will also pull specific evidence from the text to support developed analytical responses (claim, evidence, warrants) to high level questions about, plot,symbolism, and characterization. **Literal Questions - Answers can be pulled directly from the text. There is a "right" answer. **Inferential Questions - Answers need to be interpreted from information found in the text. 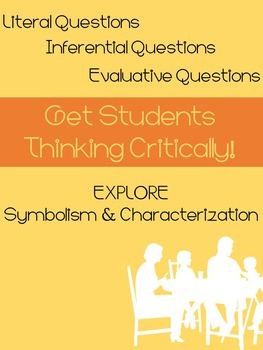 **Evaluative Questions - Answers need to be developed by evaluating aspects of the text. Looking for other short story lessons? Check out these links!